Adding an artificial lawn to your landscaping design will raise the value of you home and will likely help get it sold faster, according to home experts. Good landscaping can raise your home’s resale value between 5 and 25 percent, according to the Lawn and Landscape Market Leadership, an industry news source. Real estate experts surveyed in 2013 agree things like curb appeal and landscaping make a difference in both a home’s value and how quickly it sells. Real estate agents said curb appeal is a major factor in how quickly a home sells and the final selling price. The reason is those looking at homes will first be attracted to them while driving down the street. One expert said the curb appeal is 85 percent of what a potential buyer is going to see when they first view the property. Landscaping is also important as people begin to compare properties because bad landscaping would lead to a price adjustment. Many buyers would see fixing the landscaping as an additional price on top of the selling price. Martin Walsh, a real estate broker in Illinois, said having bad landscaping is like showing up for a job interview in a rumpled shirt. Potential home buyers can be really picky, he said in the Land and Landscape article. For Phoenix homeowners, landscaping can be a real issue because of the hot, dry weather. There are many native plants to add color, but grass is a difficult item to maintain in a typically lush style. That’s where artificial grass becomes an effective product in adding color to your lawn, improving your property values, and improving chances at resale. – It improves the look of your lawn. It is evergreen, so your lawn always looks manicured and near perfect. – It is virtually maintenance free. Artificial turf requires little ongoing care and that is a selling point for busy families who don’t have time to mow, trim, hedge, fertilize and carry out pest control measures. – It is eco-friendly. It requires no water, so potential homeowners can feel good about conserving water in an area where water is a valuable resource. That also leads to lower water bills, something else a potential home buyer will like. – It gives kids a safe place to play. Dave Tina, president of the Greater Las Vegas Association of Realtors, said green lawns are an important aspect to selling homes in his area. Part of the reason is kids need a safe place to play and nothing is better than grass. Yet, grass is hard to come by in desert-laden Las Vegas. Tina added that homes with the really nice, well-kept lawns are his top sellers in the Las Vegas area. He said homes with lush green lawns get the highest resell value and those are the properties real estate agents seek. – Installing landscaping requiring little to no water to maintain could be extremely desirable in some geographic areas. Phoenix, with its desert, would certainly be one of those areas. – Installing energy-efficient landscaping, such as planting tees where they block the sun during the hottest part of the day. – Making sure trees and live plants are healthy. – Include other items, such as a deck, patio, and outdoor lighting, in your landscaping. 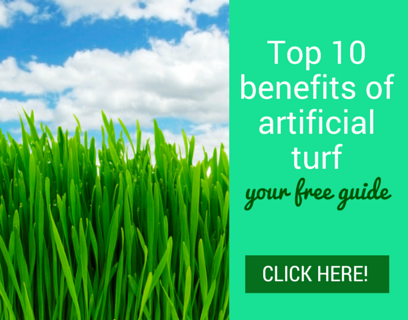 Artificial turf works wonderfully in several of those areas real estate agents are talking about. Artificial grass was made for kids to play on. The entire industry started when sports arenas started using the product in the 1960s. It stands up well under heavy foot traffic and playful children. Modern artificial grass looks more natural than the first decade of products. Today’s artificial grass consists of grass blades in a variety of shades, with some having thick thatches for more natural beauty. 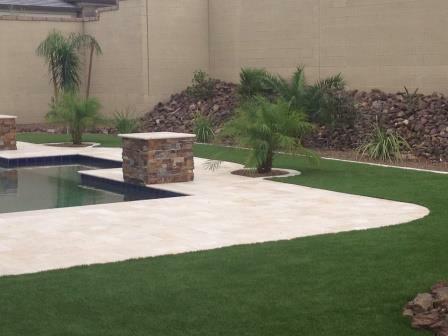 In Phoenix, having such a lovely yard would make your home stand out in any real estate listing. Artificial turf also works well with other aspects of landscaping, such as installing potted plants or live trees. It blends in naturally with the live elements in your yard to create a beautiful overall design. It also withstands Arizona’s heat really well and works effectively in an energy-efficient landscaping plan. The evidence is clear. Artificial turf is a good investment that will help your family see green as they enjoy the yard and you will see more green when the time comes to sell your home.